Does God belong to a particular race? Some people will try to tell you that He does. This chapter looks at some of the problems associated with this philosophy. Although we know very little about God’s physical attributes, some religions (and even certain Christian groups) have tried to say that God belongs to a certain race. They feel that this particular race is superior to all other races and since they are part of this race, they are entitled to special privileges. In fact, some of these groups (either directly or indirectly) teach that conquering and even killing inferior races increases their standing with God. Many suicide bombers are motivated by this belief. Race, of course, is a very divisive issue in our world. 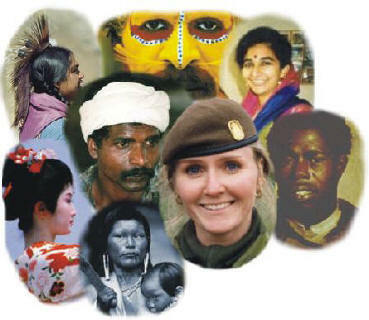 Many wars and atrocities have been committed because of racial divides. The strange thing is many of these racial differences are very subtle and insignificant. For example, I can’t see any physical difference in the people being murdered in the Baltic ethnic cleansings. Although I have tried to find the differences, these people look the same to me. The same is true for some of the ethnic cleansings that took place in Southeast Asia. Considering human nature, I’m not too surprised that political groups have used ethnic hatred and smugness to increase their political power. I am somewhat surprised that religious leaders have stooped to this depth. They have used racial tension in the community to attract more followers and to develop a larger power base for themselves. I am even more surprised that religions themselves have incorporated racial biasness as a core of their teachings. Many religions actually teach that God belongs to a particular race. In some religions, this has become a major tool for recruiting suicide bombers. The Japanese Kamikaze were an earlier version of our modern day suicide bomber. They believed that their emperor was part God and they were taught that if they sacrifice their life for him, it would earn them a special place in the hereafter. Although Kamikaze attacks increased as the Allied invasion force drew closer to Japan, the Kamikaze phenomenon cannot be written off merely as a desperate defense of their homeland. There were Kamikazes long before this. Kamikazes were used in the attack on Pearl Harbor (although they were not called Kamikazes at the time). Besides using a large fleet of airplanes to attack Pearl Harbor, the Japanese used many small submarines. Although the airplanes were supposed to return to their ships, the submarines were not. The crewmembers on these submarines knew it was a suicide mission for their emperor. God is not "White," "Black," "Asian," or "Arabic." To say that God belongs to one of these races is as ridiculous as saying that a particular stone belongs to one of these races. God is a spiritual being, not a "carbon-based life form" like us. He doesn’t have a flesh-and-blood body that has a genetic heritage. Comparing God’s "body" to ours is like comparing the weight of an apple to the color blue. They are not comparable items. Even our current bodies are not our true identity. Being created in "God’s image" means we were created as spiritual beings with an eternal soul. When our physical bodies die and our soul moves on into eternity, the issue of "race" will become null and void. At that time people will see how ridiculous it is to base so much of their religion on race. Of course, by that time it will be too late. Think about some of these suicide bombers we have been talking about. These people were under the impression that killing a person of a particular race would earn them a place in Paradise. What do you think will be their reaction when they find out that not only did they waste their life for a worthless cause, they actually did something that greatly displeased God Almighty?